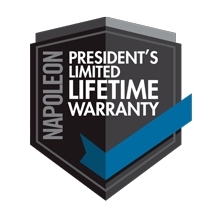 This Prestige model is yet another step up in terms of quality for Napoleon grills. With over 900 sq. inches of total cooking surface, heavy duty rotisserie, and charcoal capabilities the Prestige Series 500 s/s rear burner IR SB is the grilling sidekick you've been looking for. The infrared side burner is made for searing - locking in juices and delivering you the perfect steak or seared veggies. The stainless steel grill grates make your Napoleon even easier to care for.